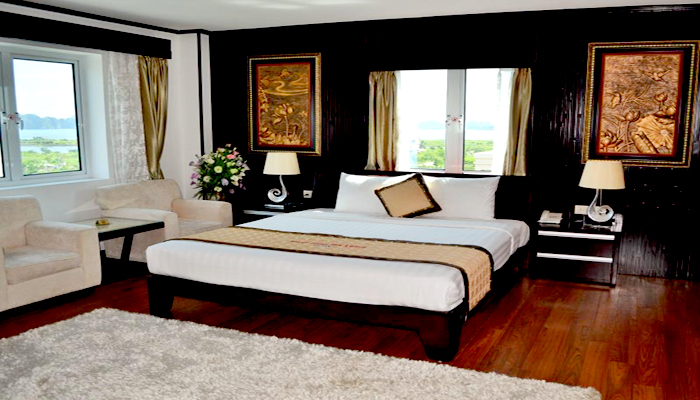 New Star Ha Long Hotel is one of the wonderful 3 star hotels in Ha Long City. This is the new hotel that was built in 2012. It has the ideal position that look Ha Long bay with the memorable time in a day. Beside the convenient and modern design from the hotel will make your time of staying here to be comfortable and warm like at your home. From hotel to Tuan Chau Island: 4.6 km. Meeting & Events Rooms, etc. Total of room: 56 rooms in which there are 3 room types. They are superior room, deluxe room, and suite room. Room features: king size bed or twin beds, internet in room, mini-bar, safety box and some other features that offered by the room type specifically.